It’s been over a year since I started to post homemade charcuterie on TasteFood. 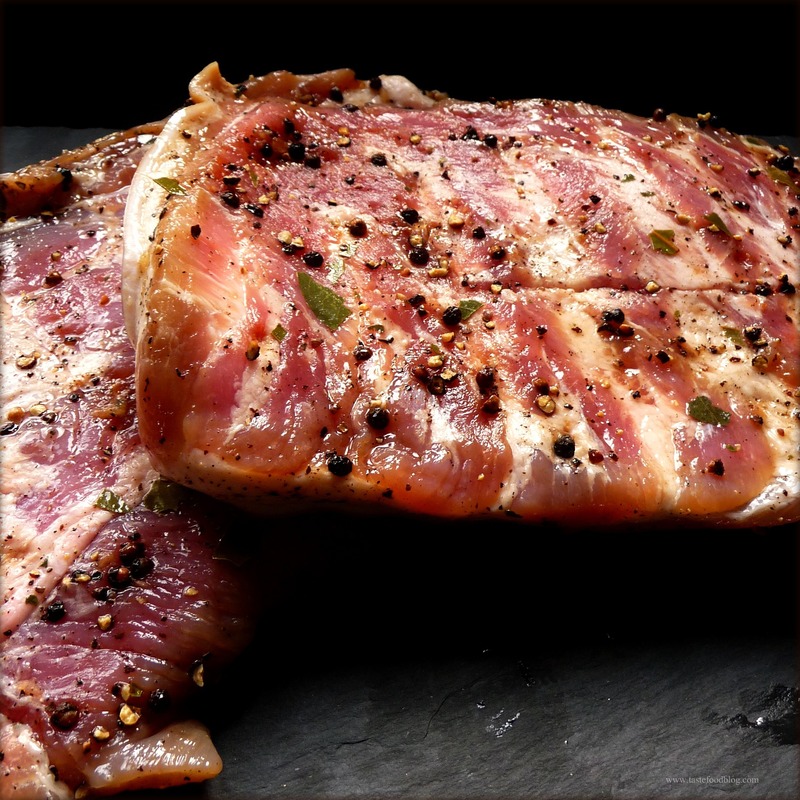 One of my favorite recipes – and easiest – is the home-cured pork belly, aka bacon, which I continue to do on a regular basis. I am here to say, that you – any of you – can do this too, and that once you try it, there will be no going back. Not only are the results positively swoon-worthy, the process is ridiculously simple. You only need to plan ahead. Five pounds sounds like a lot of meat, but the bacon is easy to freeze and a welcome gift for your bacon-loving friends. Recipe adapted from Saveur Magazine. Rinse the pork and dry. Lay on a large sheet of parchment paper. Combine salt, sugar, peppercorns and bay leaves in a mortar or spice grinder. Coarsely pound or grind. Mix in the garlic. Smear the spices all over the pork. Transfer to a large resealable plastic bag, turning to distribute the spices. Place on a rimmed baking tray and refrigerate for 7 days, flipping the bag every second day. After 7 days the pork should feel firm to the touch. (If not, refrigerate an additional day and check again). Remove the bacon from the bag and thoroughly rinse under cold water. Pat dry with paper towels. Heat oven to 200 F. Place bacon in a rectangular baking pan and roast until the meat is brown and an instant read thermometer inserted in the center reads 150 F., about 3 hours. Transfer the bacon to a cutting board. Slice off the skin with a long, thin knife. Cool to room temperature, then transfer to refrigerator. Cut in portions and wrap in plastic. Bacon will keep in refrigerator for up to 10 days or freeze for up to 3 months. See? Easy to make. All that you need is time to plan ahead for a week of letting the meat brine in the refrigerator. Admittedly, we don’t always have time for such a project, and when a go-to specialty product comes across my radar for easy use, I am interested. So it felt a bit like Christmas when I recently received a box from Alexian Pate and Specialty Meats filled with an assortment of pates, rillette and terrines. On the heels of a year of Charcutepalooza posts on TasteFood, it must have been evident that I love charcuterie. When Alexian reached out to me and asked if I would like to try a sample selection of their all-natural delicacies, it was hard for me to resist. As most of you know, I rarely do product reviews. It’s not so much out of principle, but more that I rarely come across products which genuinely excite me. Call me picky, I prefer my products authentic and my ingredients to be fresh and natural – especially when it comes to meat. So, Alexian caught my attention. Their charcuterie are all-natural, with no chemical preservatives, fillers, additives and colors, and their meats are free of antibiotics and growth stimulants. They are a family run business, and “A Certified Woman Owned Business Enterprise” to boot, with their traditions dating back to Germany’s 17th century. With that resume, I was quite impressed and eager to taste a sampling of their specialties. When the box arrived, it indeed felt like Christmas. 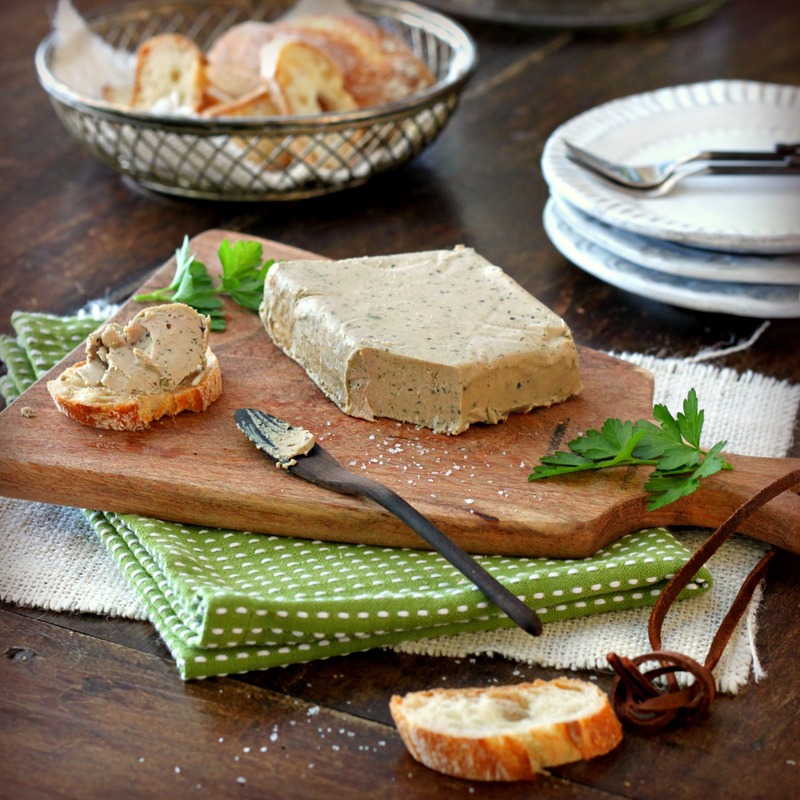 We have happily indulged in Duck Liver Mousse with Cognac, a rustic and hearty Pheasant Rosemary Pate, unctuous award winning Duck Rillettes, and a silky Truffled Mousse flecked with mushrooms and laced with sherry. The flavors of the products reflected the company philosophy. They were fresh with a clean taste of meat and no lingering gaminess. The Truffled Mousse was the family favorite, smooth, creamy and delicately perfumed with truffle. Each package came with a shelf life of at least 56 days, enabling us to savor and enjoy each item over several weeks, pulling them out for an easy rustic dinner of cheese and pate or as an appetizer while entertaining. I will continue to make my own charcuterie when I want a project. 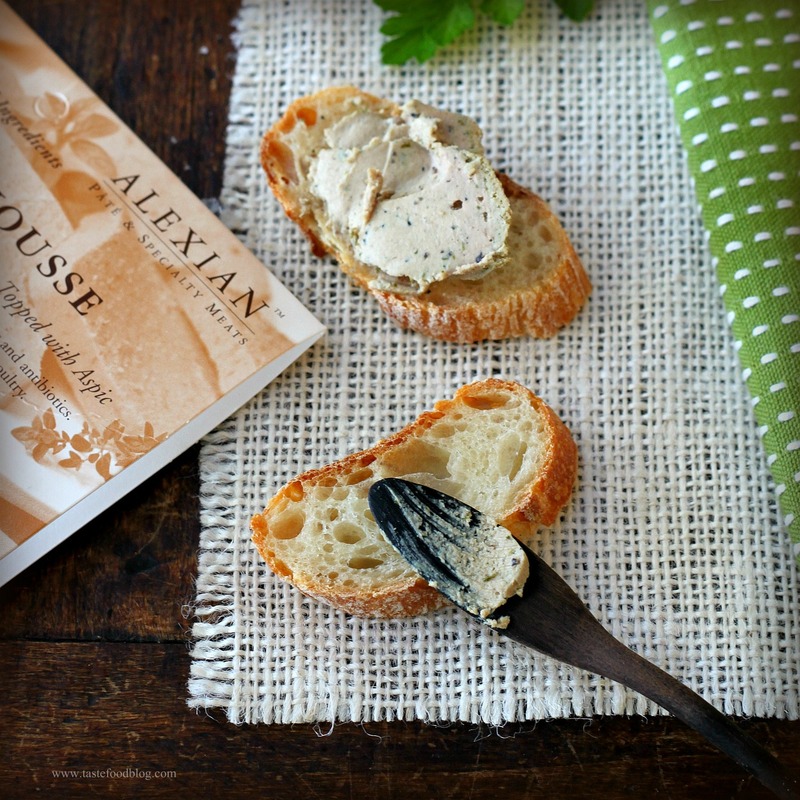 When I want a go-to specialty meat product I won’t hesitate to buy Alexian. Full disclosure: I received the Alexian products free of charge. The opinions I have written are entirely my own. Making my own bacon was revolutionary; far too easy but with results that are so stellar that nothing else measures up. This past holiday season I cured and smoked 10 lbs of bacon for holiday gifts for my family; I’m sure when they first opened that package from the USPS they were nonplussed but no more. Now the refill orders are piling up! I’ve since been the lucky recipient of a smoker. After a week in the cure, this past weekend I baked 10 lbs of a sweet combination of brown sugar and rum and smoked another 10 lbs that had been cured with paprika, garlic and pepper. I’m not kidding…I have friends who now buy shares so this particular effort will be split among 6 of us. It is far too easy and way too good and my only regret is for the years when I didn’t know! A smoker would seal the deal. It’s on my wish list! Wow, that homecured bacon looks amazing! Surely better than the store-bought stuff. And then you BLEW MY MIND by telling me how to make my own bacon. … I know what I’ll be doing this weekend. 😉 Thanks for sharing! That Bacon recipe has me intrigued…I have everything on hand but the meat…but would that mean we would eat more bacon? It certainly sounds delicious and so much healthier than those packed with the preservatives. Oohhh….this post was like a trip back to Paris. Gotta find me some of the Alexian products, they sound wonderful. And don’t get me started on that pork belly! How cool! My husband looooves bacon, and would probably love me even more for curing our own!! Looks wonderful! Beautiful. I can’t believe I missed this one!